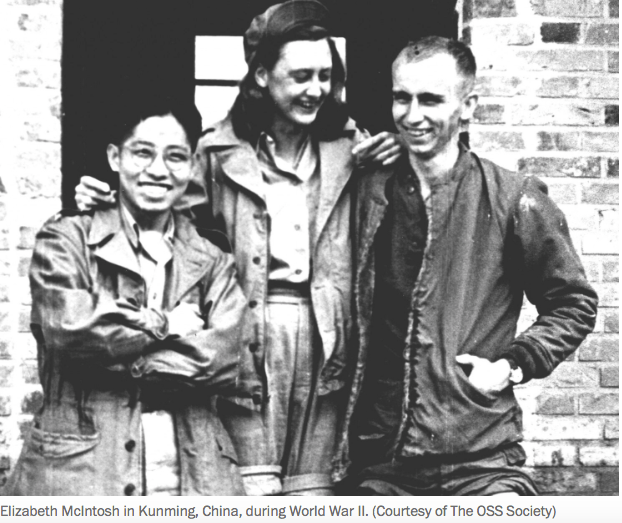 Elizabeth McIntosh, who conjured lies in the line of duty for the Office of Strategic Services and as an author wrote about the women who used their brains — and sometimes their bodies — to help that spy agency in World War II, died June 8 in Lake Ridge, Va. She was 100. The cause was a heart attack, said Alice A. Booher, her legal representative. The daughter of a sportswriter, Mrs. McIntosh grew up in Hawaii and followed her father into journalism. She reported on women’s issues for the Scripps Howard news service but grew restless after having witnessed the Japanese attack on Pearl Harbor on Dec. 7, 1941. Instead, her fluency in Japanese and background as a newspaperwoman made her ideal for “morale operations” in Asia, also known as “black” propaganda — spreading authentic-sounding misinformation designed to demoralize and confuse the enemy. Japanese soldiers were known to be honor-bound to fight to the death, and Mrs. McIntosh played a role in falsifying instructions designed to induce them to surrender more quickly in Burma toward the end of that campaign. According to an official OSS history, the forgery was successful in vastly reducing Allied casualties. On another occasion, Mrs. McIntosh delivered an explosive masquerading as a lump of coal — the device was dubbed “black Joe” — to a Chinese operative of the OSS. The agent took the dynamite aboard a train ferrying Japanese soldiers, and waited for the opportune moment to toss it into the engine before jumping to safety. The train blew up as it crossed a bridge. They settled on something vague but catastrophic — “something we can’t even mention because it is so dreadful and it is going to eradicate one whole area of Japan.” That same day, Americans dropped the atom bomb on Hiroshima, prompting an astonished colleague to ask how she knew about the top-secret program. After the war and in need of income, Mrs. McIntosh had a brief, miserable stint covering fashion for Glamour magazine before moving on to writing jobs for the Voice of America and the State Department. From 1958 to 1973, she worked for the CIA on classified operations that often used her burgeoning literary career as a cover. Her best-known book remains “Sisterhood of Spies: The Women of the OSS” (1998), which briskly sketched the careers of many of the approximately 4,000 women who served in the agency. Some were code clerks, analysts or secretaries in Washington. Another woman of wiles, Amy Thorpe, was a Washington socialite whose seduced an attache at the pro-German embassy of Vichy France to obtain a copy of naval codes that were helpful in planning the Allied invasion of North Africa. Mrs. McIntosh lectured widely on the role of OSS women and became involved in an alumni group called the OSS Society, serving on its board and as an editor of its journal. Elizabeth Sebree Peet was born March 1, 1915, in Washington, where her father was sports editor for the Washington Herald. Her godfather was Walter “Big Train” Johnson, a vaunted player with the Washington Senators. Her first marriage, to Alexander MacDonald, a journalist who served in the OSS in Thailand and later started the English-language Bangkok Post newspaper, ended in divorce. After the war she married Richard Heppner, a law colleague of Donovan’s who became deputy assistant secretary of defense for international security; he died in 1958. Her third husband, Frederick B. McIntosh, a former Air Force lieutenant colonel, died in 2004 after 42 years of marriage. She had no children and leaves no immediate survivors. After being widowed a second time, she had moved to a retirement community in Lake Ridge from Leesburg, Va.
As a young reporter, Mrs. McIntosh covered the Pearl Harbor raid and its aftermath, but she said her editors at the Hono­lulu Star-Bulletin would not run her story because it was too graphic in its description of blood-soaked children and other victims. The Washington Post’s Outlook section published it in full in 2012 to commemorate the anniversary of the attack. At her office, she wrote, “there were frantic calls from all sorts of women — housewives, stenographers, debutantes — wanting to know what they could do during the day, when husbands and brothers were away and there was nothing left but to listen to the radio and imagine that all hell had broken out on another part of the island. Thank you, Deena, I will contact you! Hello, and thank you for visiting. I am a historian with interests in archives of the personnel of the OSS during WWII. If this is what you seek, please visit this site and its links. Thank you for your interest. I hope you still do! Please refer to the German translation of the website if needed. extra material, is there any other site which presents these data in quality? Not that I am aware. There are no book sites on the OSS which has a blog like this blog — to the best of our knowledge. I hope you still come back! Please refer to the German translation of the website if needed. I’m glad it has helped you in your endeavors! Visit often! No, I thought of the cover of the first book, I was Trained to be a Spy, and then elaborated on it’s cover to show the three countries of involvement for the author: USA, Greece, England, and then to incorporate it into a theme for the tragedy of Greece during the 1940’s. Thank you for your comments and liking of the website’s theme and content! Thank you for your interest. Please visit the OSS Society’s huge treasure chest of information on the OSS. You might also look at the Patrick Leigh Fermor archives in the John Murray Archives at the National Library of Scotland, the Benaki Museum’s soon to be completed restoration on the Patrick Leigh Fermor villa in Greece, and the Smithsonian’s archives on John Vassos. Welcome to the website! The information is not random, and all researched and corroborated. Please also visit the Patrick Leigh Fermor Society, the OSS Society, the archives of both Patrick Leigh Fermor in the National Library of Scotland, John Vassos’ archives at the Smithsonian Museum, and the National Hellenic Museum. Thank you for your uplifting comments! Thank you, and please ask anything you might find unanswered!